Cornerstone Bank of Albion once again sponsored the ‘$3 for 3 Points’ program during the 2011-12 basketball season, donating $3 to the Boone Central athletic programs for each 3-point field goal made by Cardinal athletes. 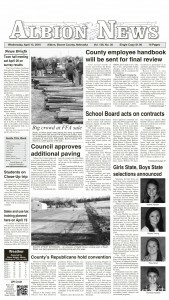 This year’s total came to $663 for 221 3-pointers (124 girls, 97 boys). 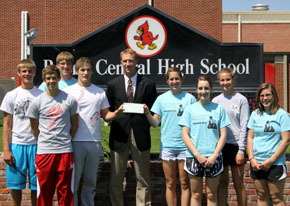 Above, Cornerstone Bank representative Todd Kramer (center) presents a check to Cardinal basketball players, from left, Derek Gentrup, Pierce Koch, Brett Temme, Colton Mazour, Jaime Kennedy, Britany Seda, Jade Gottier and Gina Nelson.